On the latest edition of the Politically Speaking podcast, St. Louis Public Radio’s Jo Mannies and Rachel Lippmann welcome former St. Louis County Police Chief Tim Fitch – who’s jumping into the political arena. Fitch often made headlines in his former job. He didn’t hesitate to go public with some of his concerns, even when it put him at odds with then-County Executive Charlie Dooley. Updated with additional quotes from Chief Belmar. A 27-year veteran of the St. Louis County police has been selected as the department's eighth chief. 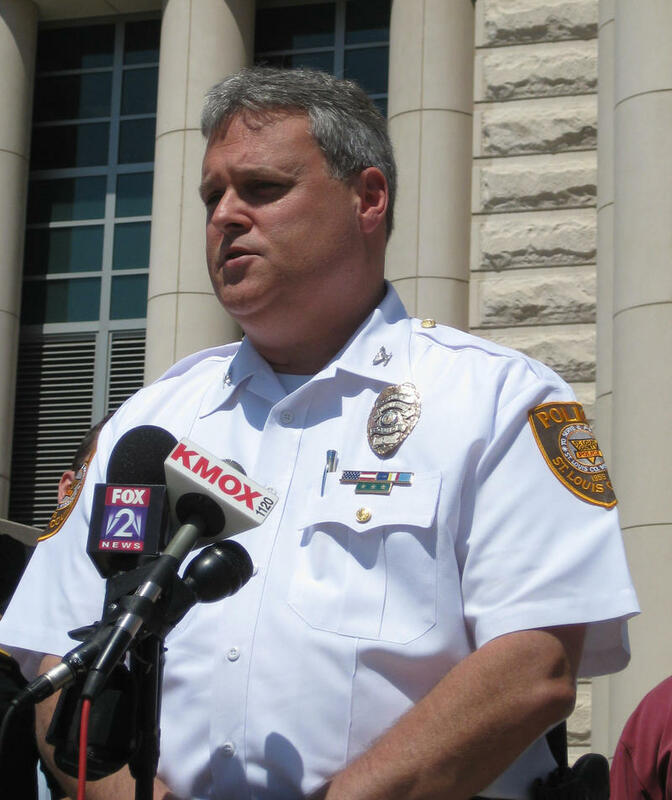 "I am pleased to announce the selection of Lt. Col. Jon Belmar as the new chief of the St. Louis County police," police board chairman Roland Corvington announced this morning, after about an hour of closed-door deliberation. 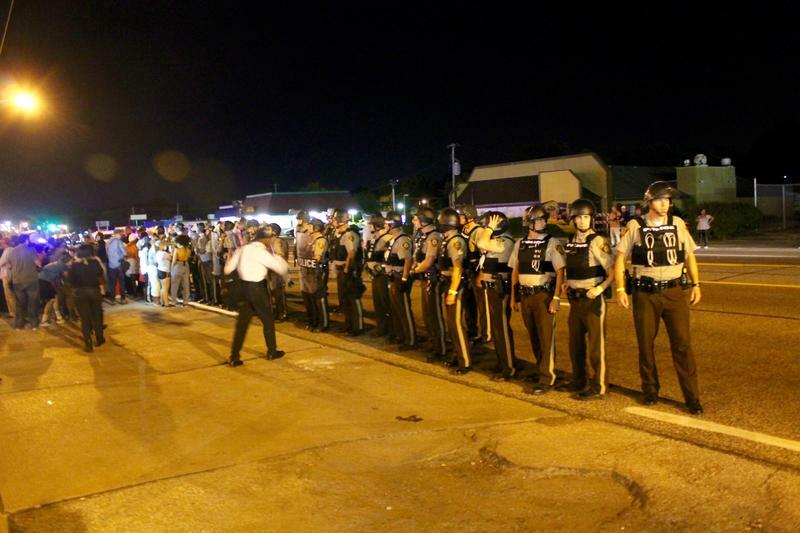 St. Louis County Police Chief Tim Fitch may need to make a little room on his wall. Crime in the parts of St. Louis County covered by the county’s police department dropped 7.4 percent between 2012 and 2013, according to numbers released by the department today. This is the fifth straight year for a decrease - something St. Louis County Chief of Police Tim Fitch called a "great accomplishment." 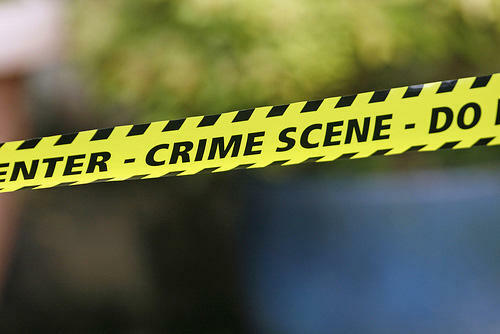 The latest figures bring the total level of crime to its lowest point since 1969. St. Louis County Police Chief Tim Fitch has been using his blog to make blockbuster declarations lately, but perhaps none was as stunning as Friday’s post in which he announced his retirement as of February. 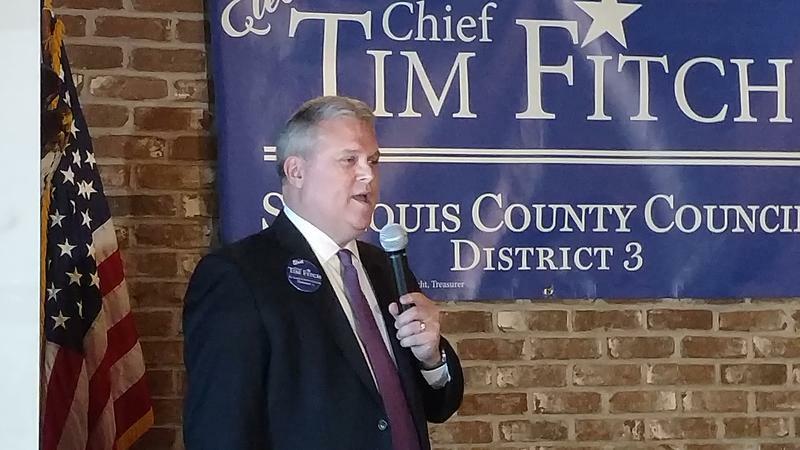 This article first appeared in the St. Louis Beacon: The controversy over a subcontract for St. Louis County’s crime lab took another turn on Monday when St. Louis County Police Chief Tim Fitch accused unnamed “political researchers” of digging up dirt about him and his department. This article first appeared in the St. Louis Beacon: The St. Louis County Council has passed a resolution offering support for St. Louis County Police Chief Tim Fitch, who's been in the middle of a well publicized controversy over a subcontract for the county’s crime lab. This article originally appeared in the St. Louis Beacon: After a string of published reports examining contracting for the county's new crime lab, St. Louis County Executive Charlie Dooley has thrown his support behind adding subcontractors to the county’s conflict of interest policy. 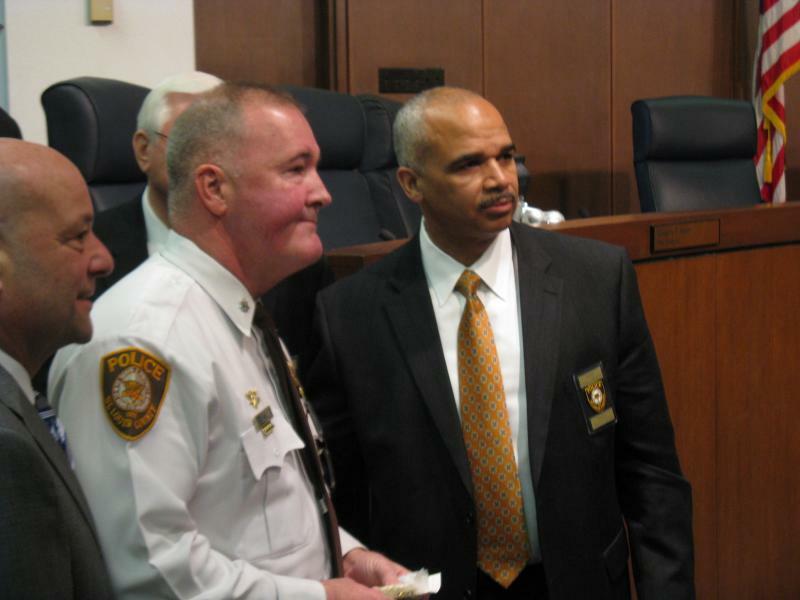 The bomb and arson units in St. Louis city and County are joining forces on July 1 - the latest merger between the two largest police departments in the region. The 10 officers will still be employees of their own departments, but will now respond to calls throughout the region in two, eight-hour shifts. The arrangement, said St. Louis city police chief Sam Dotson, should almost eliminate overtime costs. It’s estimated that there are more guns in America than people, and St. Louis County Police Chief Tim Fitch is defending his idea that arming school personnel should be considered when discussing ways to improve school safety. Speaking to St. Louis on the Air host Don Marsh today, Fitch acknowledged that there are serious concerns about his proposal. But, the police chief also said he hasn’t heard any other ideas for how to address what he said is a critical gap in time when someone starts shooting and police can respond. Both St. Louis city and county police are stepping up patrols around schools following the shootings in Connecticut. St. Louis County Police Chief Tim Fitch says the extra patrols began this afternoon and will remain in place until further notice. 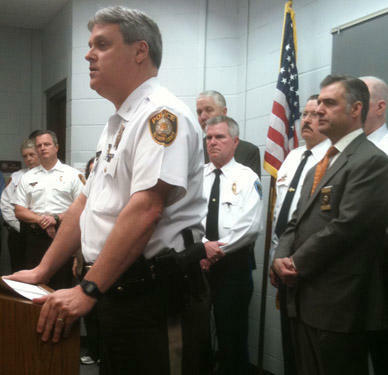 Fitch says the department already has 31 school resource officers in districts around the county. 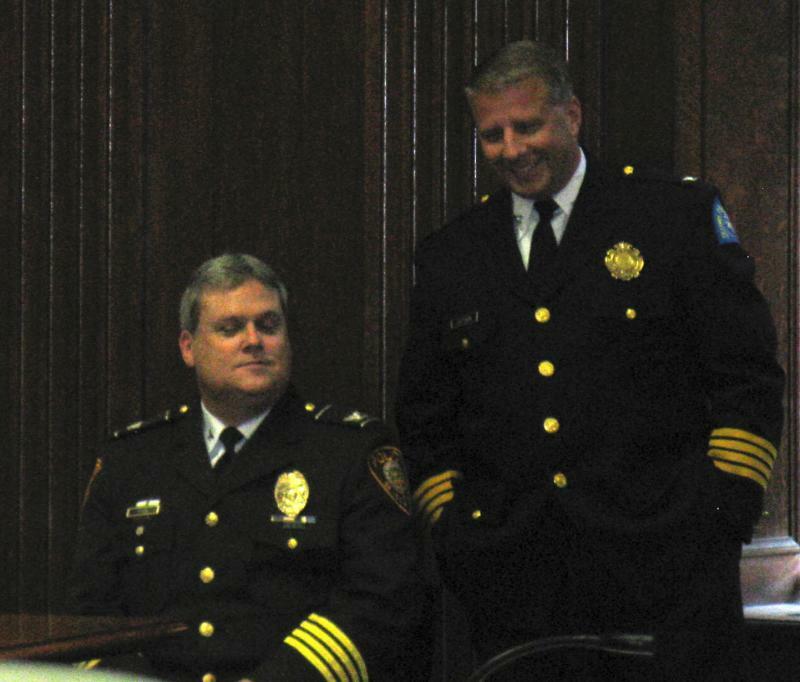 For the past year, St. Louis County Police Chief Tim Fitch and community organizations have held nearly two dozen town hall meetings to raise awareness of the heroin epidemic. Deaths from heroin overdoses continue to decline, but officials say they are seeing an uptick in some age groups. Through September of this year there have been 45 heroin deaths in St. Louis County, that’s compared to 55 last year. St. Louis Public Radio’s Julie Bierach sat down with Chief Fitch to talk about their efforts to go after heroin suppliers. St. Louis County Police are filling a law enforcement gap in Dellwood as efforts continue to disband the suburb's municipal police force. Dellwood's Mayor, Loretta Johnson, requested the county's help while eight of Dellwood's 16 police department positions remain vacant. 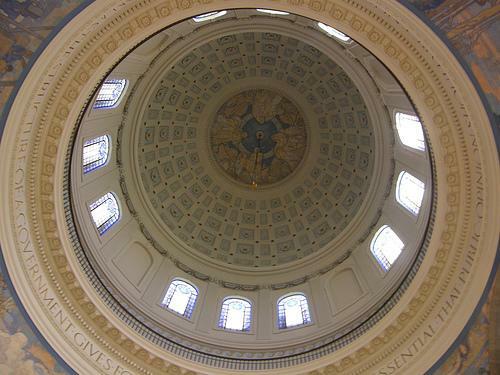 Missouri’s special legislative session begins today and is focused primarily on an overhaul of Missouri’s tax credits. The plan would eliminate existing tax breaks for low-income seniors and disabled residents who live in rented homes. New incentives would be created for international cargo shippers at the St. Louis airport, computerized data centers, science and technology companies and the organizers of major amateur sporting events.